Several late nights and lots of last minute scrambling equals organized chaos. 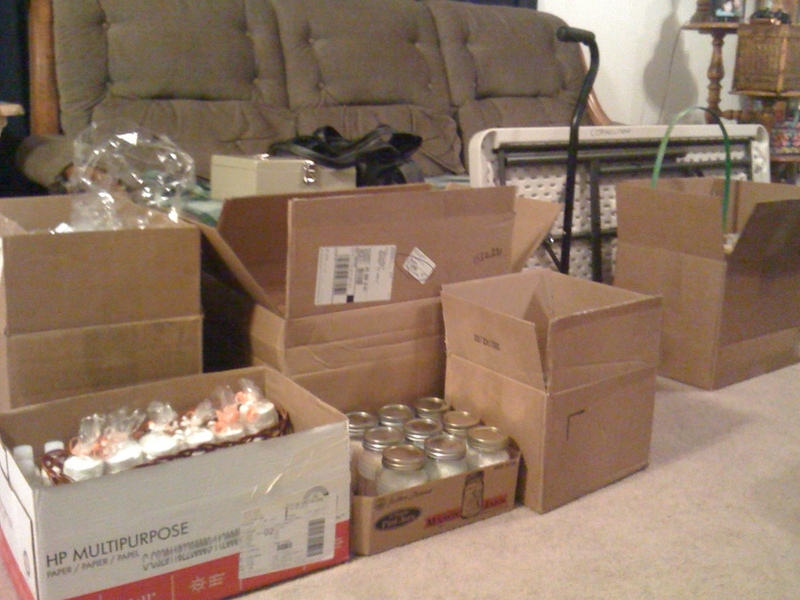 Everything is ready to load into the car and head down to Overbrook’s Sunset Stroll. In 12 hours I will have my booth set up. *sigh* I’m very ready for this to be over. I found out Tuesday AM that I’m required to put the weight or volume on every item. I can put a minimum amount and the product can exceed that, but the product must never be less than the labelled measurement. It is getting really frustrating to fulfill all of these requirements. In light of that, I did a little more research and found that as long as I don’t make a regular income from it and don’t have a business plan, etc., then I can be considered a hobbyist and can drop the ingredient label. Now that’s a relief! It’s hard to get all of that on one label. I can’t get bigger labels or else there won’t be any product visible! Lol. This is idiotic. Since I had to add weights/volumes, I stopped doing the ingredient labels on everything that I had to label today. So there FDA! *sticking tongue out at the invisible threat* I wish I’d had a helper the last few days to help w labeling and packaging, but on the flip side I’m very proud of myself for managing to get it all done despite the slow pace. I’m hoping that only half of this chaos comes back tomorrow night *grin* I have no clue what might sell, so I have most of my premade items on hand. I’ll keep the additional items of each variety in the car, so it doesn’t look like my tables are going to collapse lol. I do plan to put the fall items front and center though. I have baskets packed (actually the product is in the baskets in the boxes, so set up will be a breeze) and will display in groupings. I have to say that my fall products created in the past 7 days have turned out fabulous except for one total failure that is strictly because the FO isn’t very good. I’m looking forward to seeing if Pumpkin Buttercream or Apple Pie scented items will do well. Please cross your fingers for me that things go well and I get lots of new customers. I really appreciate the encouragement and support everyone is showing me. It really means a lot and keeps me going when the chaos isn’t yet organized *grin* I hope you’re all sleeping well while this insomniac blogger jobbyist (learned this word today – when a hobby crosses over into “almost” a job, but is really just a complicated hobby) starts to loosen my bunched muscles. Happy Wednesday! !